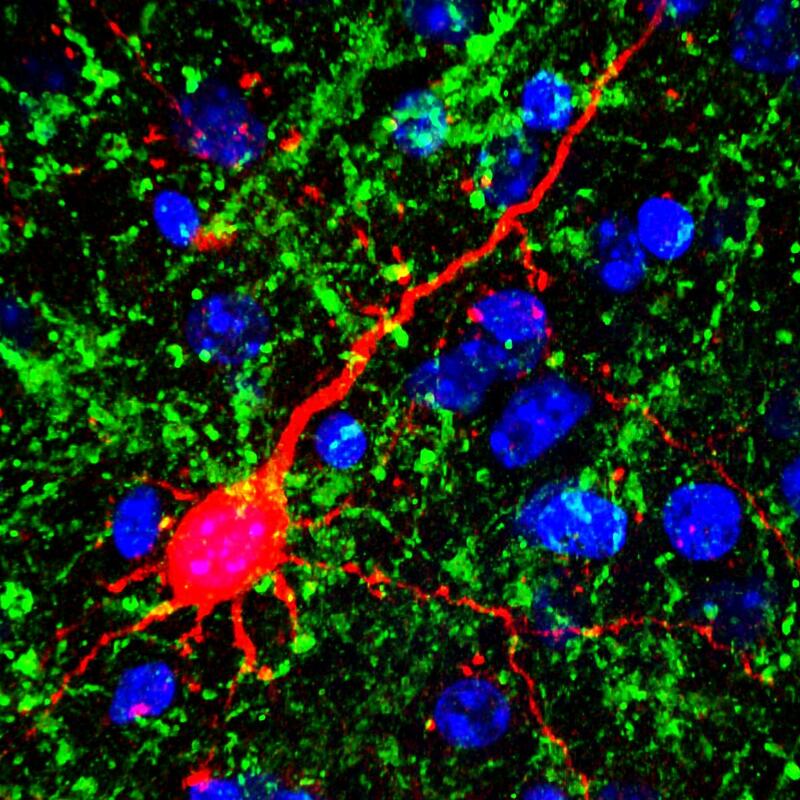 Caption: A neuron (red) in the auditory cortex of a mouse brain receives input from axons projecting from the thalamus (green). Also shown are the nuclei (blue) of other cells. Many people with vision loss—including such gifted musicians as the late Doc Watson (my favorite guitar picker), Stevie Wonder, Andrea Bocelli, and the Blind Boys of Alabama—are thought to have supersensitive hearing. They are often much better at discriminating pitch, locating the origin of sounds, and hearing softer tones than people who can see. Now, a new animal study suggests that even a relatively brief period of simulated blindness may have the power to enhance hearing among those with normal vision. In the study, NIH-funded researchers at the University of Maryland in College Park, and Johns Hopkins University in Baltimore, found that when they kept adult mice in complete darkness for one week, the animals’ ability to hear significantly improved . What’s more, when they examined the animals’ brains, the researchers detected changes in the connections among neurons in the part of the brain where sound is processed, the auditory cortex. The new findings are surprising because such drastic changes in neural wiring were generally thought to occur only during a critical window of development in early childhood. That’s why children are such quick learners. As we age, the brain becomes less plastic, which means it’s less adaptable and less capable of remodeling neural connections. But this new study suggests we may have underestimated the brain’s ability to adapt in adulthood. The research began when a team led by Hey-Kyoung Lee, now at Johns Hopkins, was exploring the impact of vision loss on the brain’s wiring. To Lee’s surprise, she noticed that animals deprived of sight had changes in a brain region that processed sound. This was an intriguing observation, because the sight and sound processing regions of the brain are not connected. These counterintuitive findings led Lee to forge a collaboration with Patrick Kanold, a neuroscientist who studies the auditory system. The key questions facing the researchers were: does loss of vision lead to changes in the auditory cortex? If there are such changes, do they actually affect the animals’ ability to hear? To get some answers, the researchers placed adult mice in a dark room and allowed them to scamper around, as they normally do, for one week. Researchers then implanted electrodes in the animals’ auditory cortex, which receives sound data from another brain region called the thalamus. The mice were then placed in a sound chamber, where they were exposed to a variety of sounds. As it turns out, the mice that had been in the dark for one week proved much better at detecting sounds and distinguishing among sounds of varying frequencies than similar mice that had not been in the dark. Measurements of electrical activity in the animals’ brains also showed that darkness-exposed mice displayed stronger signals in the synapses connecting the auditory cortex and the thalamus. After returning the animals to normal light cycles, the changes lasted only about a week—so the researchers’ next goal is to figure out how to make these improvements in hearing last longer, possibly even permanently. This work suggests possible new ways to address hearing loss. If further studies show that similar brain remodeling occurs in humans, we might be able to leverage this mechanism to enhance hearing in people with hearing loss or with cochlear implants, which are small electronic devices that provide a sense of sound to those who are profoundly deaf. From a neuroscience perspective, what is most striking is that the wiring changes observed in the dark-exposed mice occur not in the visual cortex, but in the auditory cortex. The converse is also true. When adult mice were deprived of their hearing, the researchers found the animals had more activity and rewiring in the region connecting the visual cortex and the thalamus. So, at least in mice, it appears that the brain responds to sensory loss by swiftly reallocating connections among the remaining senses, perhaps providing the animals a better chance at survival. This provides hope that we may someday be able to help people not only with hearing loss, but a wide range of other sensory disorders, through strategies that selectively rewire the brain. Crossmodal induction of thalamocortical potentiation leads to enhanced information processing in the auditory cortex. Petrus E, Isaiah A, Jones AP, Li D, Wang H, Lee HK, Kanold PO. Neuron. 2014 Feb 5;81(3):664-73.